Veteran hard rock singer Gary Barden rose to fame as the front man for MSG, Michael Schenker's young project, during the Eighties, and then hooked up with him once again in the last decade. He has had similar success with Praying Mantis, Statetrooper, and Silver, and also through several solo efforts. Eleventh Hour is his fourth solo outing for Escape Music. Perhaps the most surprising, and pleasing thing, about Eleventh Hour is the strength and versatility of both Barden and the songs on this album. Barden demonstrates that he has lost nothing in his vocal performance, whether it's on the edgier hard rock of Baghdad or the smooth AOR of What You Wanna Do, by example. We Are Dead offers more straight melodic hard rock, with some impressive drumming and a solid bass line. All In Can only be described as 'big beat' rock, accented by crackin' guitar rips and that near perfect drumming. Blackmail offers a different, almost funky, groove. Couple this song with the steady, bit blues, sound of Easy Does It, and you have two more fine examples of the genuine creativity here. 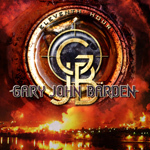 Later, Before the Eyes of the World, the longest track, finds Barden getting epic, mixing a steady pace with a metal edge and a dynamic choral vocal arrangement. To say that Gary Barden is still in fine vocal form is pure understatement. Eleventh Hour offers great and diverse songs as a platform for his exceptional talent. Well recommended. To say that Gary Barden is still in fine vocal form is pure understatement. Eleventh Hour is offers great and diverse songs as a platform for his exceptional talent.